Volkswagen is predicting 40% of its global sales volume will be SUVs in the near future, with plans for a range spanning 19 models across the different markets in which it operates. The Volkswagen T-Roc will launch at the end of the year. The latest in the range is the T-Roc, revealed this week, which will enter a new segment beneath the Tiguan when it launches at the end of the year. Platform-shared with the Golf, it’s roughly the same size as an Audi Q2 and will be priced from €21,000 in Germany. Engines will include 1.0, 1.5 and 2.0-litre petrols, and 1.6 and 2.0-litre diesels, with the Q2’s figures implying range-best CO2 emissions of between 110 and 115g/km. Globally it joins a range which, by the end of the year, will include five and seven-seat versions of the Tiguan, the Atlas and Teramont sold in North America and China respectively, and the Touareg. A new Touareg, previewed by the T-Prime concept, will be shown at the end of the year, and a Polo-sized crossover called the T-Cross, likely to echo styling from the T-Cross Breeze concept, will break cover in 2018. An all-electric crossover is also in the pipeline, a hint of which was shown in the I.D. Cross. 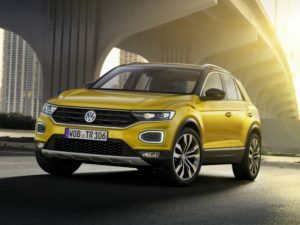 “We expect to see further strong growth for years to come,” said Dr. Herbert Diess, chairman of the board of management of the Volkswagen Passenger Cars, speaking at the reveal of the T-Roc. “Forecasts expect [sales of] these SUVs will grow by 50% in the next ten years. This affects all regions; Europe, China and the American markets, and all SUV segments, and especially small SUVs, which are very popular. This market is expected to double to 11m cars by 2027.